Not more than a few days ago I had my Mother's Blessing. The women in my life gathered to share their stories of motherhood and to give me strength (and many freezer meals) when the time comes that I too will experience the journey of birth. We talked and laughed over mugs of hot chocolate and bowls of plump, cerise strawberries. We each decorated our own gingerbread men with a rainbow of lollies and added our artistic touches to tiny white jumpsuits for the baby (thanks to Claudia for the wonderful idea). The end of the day was marked with a bead ceremony, where each woman gave a bead that represented them, along with their own blessing for the baby. Those beads now lie together in a bracelet, for my child to wrap their fingers around whenever they feel the need to be comforted by the love of all the women in its life. I wish for you to find strength when days seem dark. To draw upon all those who came before you, who may no longer be here but whose blood runs through your veins. Remember that our strength is your strength and that you are never alone. I wish for you to be warmed by happiness as the Earth is warmed by the sun. To remember that happiness is a choice, not a set of circumstances. So dear child, choose to be happy and allow yourself to be filled with positive light even when shadows seek to smother it. And lastly, I wish for you to find love as your father and I did. A love that makes you want to live an eternity with them so as never to be apart. A love that allows your soul to reach its highest form of being and your heart to burst with joy. A love of a best friend and a true beloved. Those are our wishes for you my sweet. After a day filled with sweetness, it ended with a glass of milk and the most delicious morsel of a cookie. taste: 4/5. My go-to chocolate cookie. I first made these beauties almost 3 years ago and yet I never forgot them, and am quite uncertain as to why I waited so long to make them again! I prefer to make larger cookies which yield a chewier, fudgy center that compliments the crunchy meringue shell beautifully. 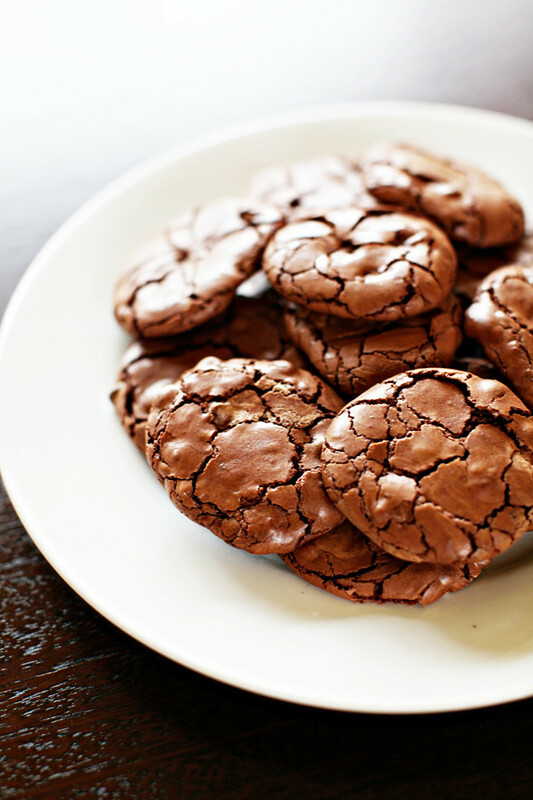 These cookies are dark and sweet and completely addictive. With the larger cookie size I ended up with 24 cookies. would I make it again: Yes, this is now the second time and only the beginning. What a lovely post; such a happy and moving blessing for your child! I wish you all the best with your pregnancy journey. I found your blog through Food Gawker and have thoroughly enjoyed your pictures and stories. I also love the 'would I make it again' commentary. It's a great review of the recipe and you've saved me wasting pricey ingredients on those that were only mediocre. 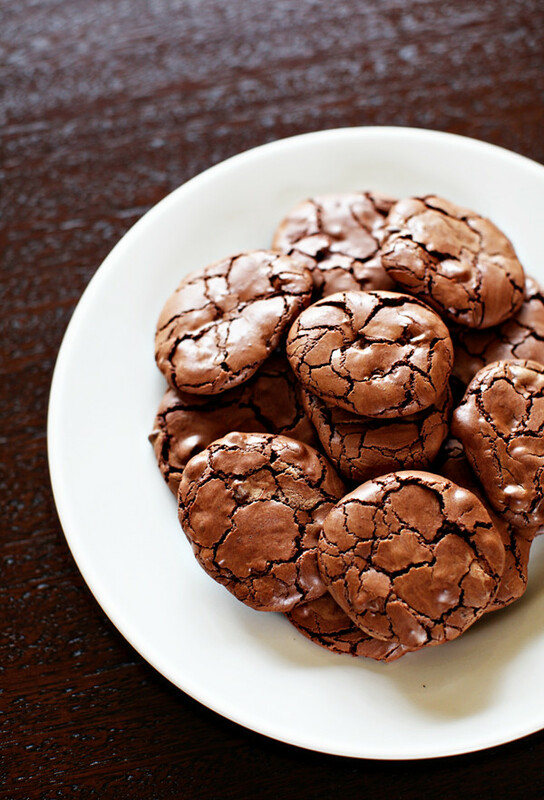 I am, however, sold on these Chocolate Brownie Cookies on your recommendation. What a gorgeous post and such a delightful idea for an alternate to the ubiquitous baby shower. The cookies look brilliant too! mmm... delicious! i think that I made it at week) thank you for your blog! Oh, that was so lovely it made me cry. I had a wonderful daughter, Ruby, in March, but I live far away from friends and family. I'd have loved to have done something like that. Wishing you and your child much love and happiness. Just found your blog on foodgawker and favorited this recipe! :) Amazing love this. What a beautiful, beautiful post. And food-wise, I've never found myself craving cookies but I do love the sound of meringue outside and gooeyness inside! i didn't have enough choc chips so i chopped up some peanuts and added them. worked out really well. i didn't have the oven up high enough.. calculated incorrectly.. and so the meringue crust didn't happen. they are still wonderful though! yeah, it's always trial and error with ovens, I normally have to lower my temp and cook for a shorter time for most recipes. You should have taken a pic, would be interested to see what they looked like without the crackle top. Wow what a lovely way to celebrate the little one's soon to be arrival. Thanks for sharing such a personal blessing in your post, really beautiful. Gorgeous...bookmarking these! Beautiful post this! Oh my! I can just taste these already from your photos -- it's the best of both worlds! These look so yum... am making them this weekend:) Thank you for sharing... I'll let you know how mine turn out. They look great and I just tried to make them but the batter was way too runny, even after keeping for the recommended amount of time. The cookies turned out way too flat. I have refrigerated the rest of the batter to try after chilling.